Patrick Murphy, far right, makes sure to digitally chronicle his friend Cory Cheyne grinding corn into paste for empanadas. Students worked for about 45 minutes preparing their breakfast. It was far from the easiest day in their lives, but for a half dozen students from the University of British Columbia's Okanagan campus, a community service learning adventure in the Mayan jungle is one they won't soon forget. Despite a 3:30 a.m. wakeup call, a 1.5-hour commute each way, hard work and an uncomfortable cocktail of bug repellent and sweat, the university students who were taking part in the Spanish Summer Field School received insight into how Mayans in the rural community of X-Hazil, Mexico, embrace their lives and make the most of everything they have. Patrick Murphy was not looking forward to volunteering in the jungle, but it turned out to be a better experience than any of the tourist-oriented excursions he had encountered to date on the trip. "Nobody likes getting on the road at four in the morning," says Murphy, who was born in Trinidad. "I thought it was going to be boring and painful. I thought it was going to be a day of dread. It turned out to be awesome. It felt like we were actually giving back to the community rather than just being there." Arriving in X-Hazil before sunrise, students were immediately put to work washing corn in an outdoor sink. Participants noticed how Mayans make the most of what they have as the sink water drains into a hose which then waters the garden. 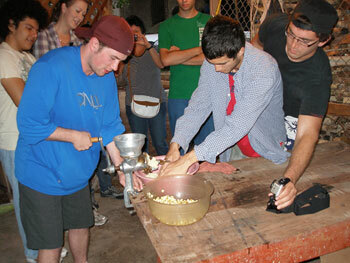 Using a manual hand grinder, the UBC contingent took turns processing the wet corn into paste. The mixture was then fashioned into empanadas, filled with cheese and eventually fried over a rustic concrete wood stove. The breakfast started with tree-ripened papayas and eventually moved on to the empanadas. "Their life is so much harder than ours," says Murphy. "The work they do just to put food on the table ... They appreciate their lives so much more than the average Canadian appreciates ours." Following the hearty meal, students were led to a community church where they cleaned the yard with machetes, large knives and rakes. Since this type of work is not common in Canada, the following day most commented on having sore muscles. For the students, volunteering in a foreign community is an important piece to their development as global citizens. Joanne Gabias was reminded of a previous volunteer experience in Latin America. "I have done Habitat for Humanity in Guatemala and I loved every minute of it," says Gabias. "I think that these types of (volunteering) should be part of school and related to your major." Mayan host Eulogio Cruz showcased not only his home and village, but took the Canadian students two kilometres off the main road into one of his fields, which he had been working for more than four decades after first cutting it out of the jungle. On uneven terrain, the Mayans plant their crops in small pockets of topsoil. The Canadian visitors were visibly impressed by the amount of work involved in generating food for their families. After returning to the village, students were given a 40-minute break to snooze in indoor hammocks and recharge their batteries before going onto the court for some international competition. Despite losing a friendly volleyball match against local youth, the field school students represented their institution with class by congratulating the winning squad with smiles and handshakes. The Mayan students were then given an unexpected bonus, an array of discontinued university sports jerseys, courtesy of field school student Kaitlyn Shinness. "We didn't want to waste them, so it was good to make sure they got used," said Shinness who works in the UBC Athletic Department. "They really appreciated getting them." Collegiate jerseys left over from the volleyball match were handed over to the Quintana Roo University Intercultural Studies Centre for distribution. The student's X-Hazil adventure was finished with a delicious lunch at the long family table. Almost all students commented on the family structure and how the Mayans seemed content with their limited services and amenities. "The unity of the family is so important to them, the fact that the whole table is filled with people eating and having fun. For them, every day is like Christmas. They're all kidding around," says Gabias. "Most students in Canada don't have that." The X-Hazil trip was the UBC students' second community service learning activity as part of their three-week field school experience. Earlier, they volunteered time cleaning out a former Quintana Roo University research station at Mahahual in the Costa Maya. The station had been abandoned since 2007 when it was decimated by Hurricane Dean. The university has plans on refurbishing the research station in the port town.